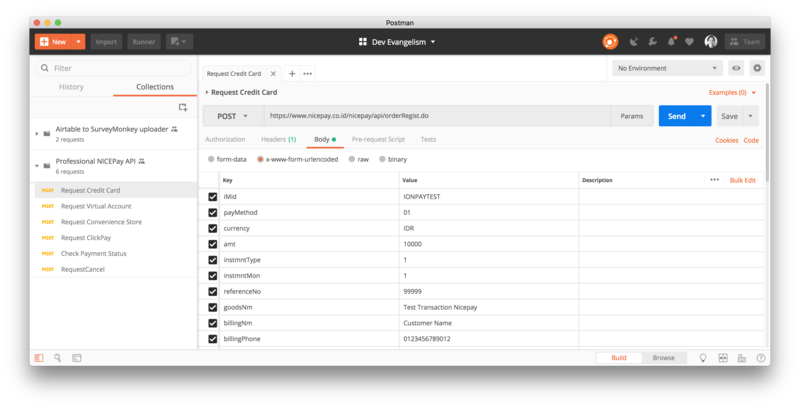 Are you an API builder using Postman to document your APIs? If so, make sure to share your API with the rest of the 5 million developers using Postman. The Postman API Network is the most authentic collection of APIs currently published. As of today, we are making it easier than ever to get your API listed in the Postman API Network! Want to share your API? Hundreds of thousands of developers are already using Postman to share public or private API documentation in a beautifully formatted web page. To share your API documentation with your users and the rest of the Postman community, make sure this checkbox is selected when you’re publishing your API. Verify your team name, logo, and description. Select the categories that best describe your APIs and service. You can update the custom styling options to reflect your brand aesthetic, and then hit Publish. The Postman team will review the submission for approval, and then your API will be accessible to millions of developers worldwide. From the Postman app, click the orange New button and select the API Network tab. Search for an API, or browse by a particular category. 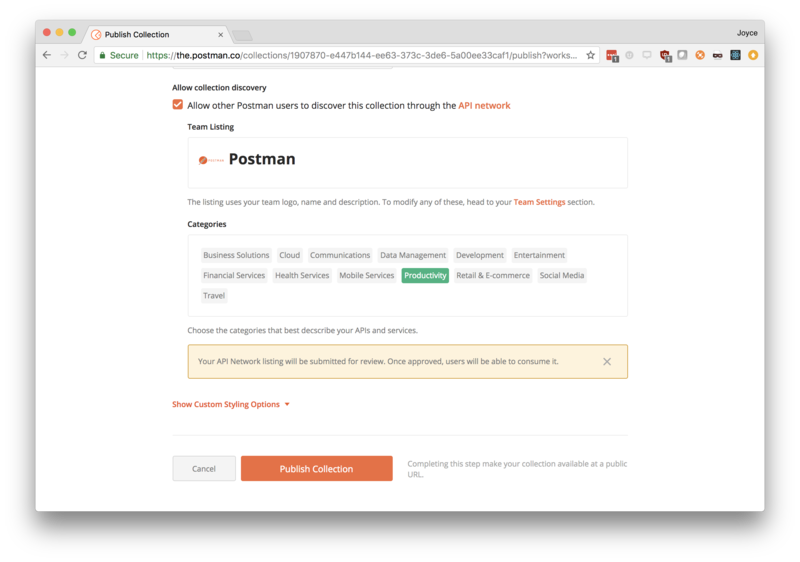 When you find the API that you’re looking for, click the Run in Postman button to import the collection into Postman. And that’s it! This is why we call a Postman collection an executable description of an API. 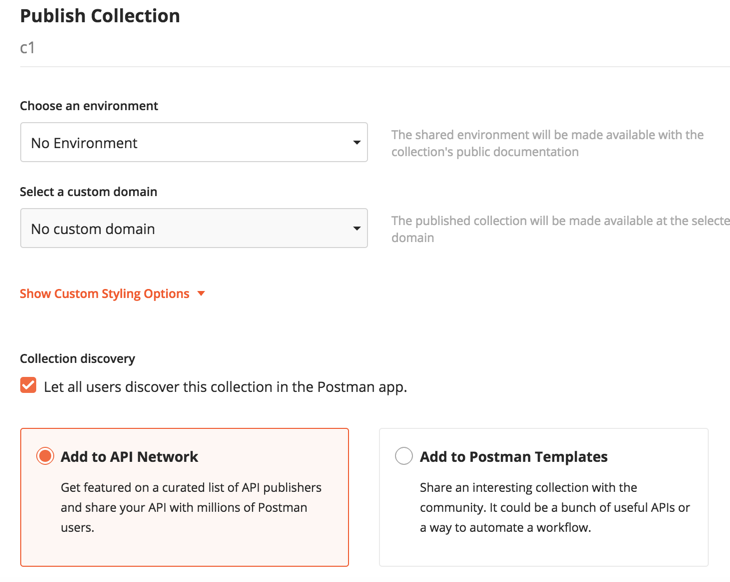 Once you import the collection into Postman, you can start executing API requests right away. Keep your eyes peeled. The Postman team will also be exploring exciting and new entries into the Postman API Network.